Yesterday, January 21, was the feast day of St. Agnes. She was a young girl of the 4th century who consecrated her life to Christ. She was exceedingly beautiful and many men sought to marry her, but her only desire was to be in holy matrimony with her beloved Jesus. When a young nobleman sought to make her his bride, she refused. He took his vengeance by having her imprisoned for the crime of being a Christian. She suffered tortures but refused to renounce her belief in Christ. She died a virgin at age thirteen and was a highly revered martyr of the early Church. St. Agnes exemplifies the love of God by which all of us are called to lead our lives. She also exemplifies Christian morality in an immoral world. This young girl teaches us to remain holy in the midst of a world that constantly challenges our faith. Even as the secular society attempts to impose standards of promiscuity on the consciences of young people, the Church continues to stand for an uncompromising chastity. 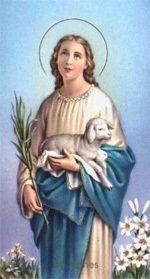 The symbol of St. Agnes is a white lamb, representing purity. As we prepare for the annual March for Life to end abortion, it is fitting to address our prayers to the patron saint of chastity. I have been thinking about St. Agnes for a while, her story shocked me deeply. I'm amazed about the determination and courage of saints, many have been tortured in many ways, I sometimes feel that I do no stand up enough for my creed and faith. I hope one day to become as good as St. Agnes. Thanks Ride. I've been reading a book called "Fire Within" which is about St. Teresa of Avila and St. John of the Cross. It doesn't go into great detail about their lives. Instead it talks about their spirituality. The topic of the book is "infused prayer". This refers to a type of Christian deep meditative prayer where God which lives inside us begins to speak to us. A major point of the book is that this does not happen through meditation alone, but is dependent on living a Christian life and practicing the virtues taught by the Church. The two (prayer and Christian life) complement each other and strengthen each other. The author is Father Thomas Dubay. I previously read a book of his titled "Seeking Spiritual Direction". I was so impressed and touched by what he wrote there that I was led to read "Fire Within" which is his most well known book. I've been hesitant in the past to explore the "mystical" side of Christianity. It sounded a bit too much like some of the new age practices of meditation. But Father Dubay is careful to make a clear distinction between the two. I hope you are well, Ride. The great thing about the love of God is that it never deserts us and will never disappoint us. This is a point that Father Dubay makes in his writings. Our everyday lives are full of disappointments and we have the added frustration that we have no control over these events despite all our efforts at careful planning. But our relationship with God is a constant comforter. Perhaps the greatest danger is that when we feel physically comfortable and prosperous, that we are tempted to abandon God. That's when we are most vulnerable of falling back into sin. P.S. Sadly, Father Dubay passed away September 26, 2010 at the age of 88. I just watched a program on EWTN called "Women of Grace" and the topic was Christian prayer vs. transcendental meditation. Towards the end of the show they prominently mentioned the books I discussed above – "Fire Within" and "Seeking Spiritual Direction" by Father Thomas Dubay! I was watching "Women of Grace," it was very interesting Michael. Thank you for sharing it with me! I'm considering to order both "Fire Within" and "Seeking Spiritual Direction." Right now I'm going to start reading Mere Christianity from C. S. Lewis. I read some good comments about it, I'm going to give it a try. Hi Ride. I've read bits and pieces of C.S. Lewis, but never a whole book of his. I'm attracted to the books by Father Dubay because he gets more into the spiritual aspects of Catholicism. Lewis takes a much more rational approach to Christianity which does not appeal to me as much. That is almost a Protestant approach, which has withered under the constant pressure from Humanism for more and more reforms and concessions. At some point there is only a bare skeleton of Christianity left adorned with Humanist thought. And then the next logical step is to abandon Christianity altogether in favor of Humanism. That is where we are today. We can all recognize that today, but it was not so obvious when we were taking that next small step away from Christianity that this would be the outcome. "Fire Within" deals exclusively with what some people call "mystical" prayer. I'm not that comfortable with the word "mystical" because it reminds me too much of "magical". I prefer something more like "spiritual" prayer. Father Dubay speaks specifically about the teachings of St. Teresa of Avila and St. John of the Cross, who are both Carmelites. I think "Fire Within" could have been edited down substantially. There is a lot of duplicated material. But in one sense the repetition is good because it reinforces the teachings of the two Carmelite saints. And since this is radically different from the teachings of our modern culture, it takes a fair amount of pounding into the brain in order to become convinced that what is being said really is the Truth. But then considering how many times and in how many ways we have had the poisonous messages of our culture drummed into our heads, it stands to reason that it would take a fair amount of repetition to dislodge those ideas and attitudes. And even that is not enough. It definitely requires the inspiration of the Holy Spirit to be open and receptive to the Gospel teachings, which as Father Dubay repeatedly points out is the same as the teachings of the Carmelite saints. So while I wouldn't say that "Fire Within" is a difficult read, it does require some persistence and dedication to get all the way through it. Trust me though that it is inspired reading. It's life changing, really. I wish I would have read this book when I was in College and would have had the courage to use the Christian principles articulated here to rule my life. This book is revolutionary and liberating in the same way that the Gospel is revolutionary. It is the undistilled Truth. It is counter-cultural to the core. It makes the bold claim that we can speak directly with God through prayer; that God lives within us in the form of the Holy Trinity. St. Teresa and St. John teach us how to progress to different stages of prayer to the state of "infused" prayer, where God is speaking directly to our souls. Anyone can do this, but most people will not be willing to make the sacrifices and changes in their lives that this requires. It is like when the young man asks Jesus what he must do to become his follower, and Jesus tells him that he must give up everything. It requires going through the sufferings of purgatory on earth, but then like the saints the person is spared purgatory in the afterlife. It requires going through a purification of fire. St. Teresa describes something like a Divine Sun burning inside of each of us - the "fire within". To see it's light we must only desire it and have the faith to follow the path. ("Ask and it shall be given.") And then that Divine Light kindles a fire within our souls. The result is a soul that radiates Divine Love. These are not metaphorical statements but real changes which are described by St. Teresa and St. John, which they personally experienced. Ride. Re: "Seeking Spiritual Direction"
I read this book before "Fire Within". I feel like now that I have read "Fire Within" that I should go back and re-read "Seeking Spiritual Direction". It's a great life-changing book. Father Dubay could have been a CEO of a Fortune 100 company or at least a top business consultant if he hadn't decided to become a priest. His advice is like a spiritual manual for the soul. If you think of yourself as a company, then he explains how to manage yourself properly for the maximum benefit of your Christian soul. He starts off the book by saying that he does not recommend being self-directed, but about half-way through the book he starts to offer advice for those who do not have a personal spiritual director. His advice is tough and non-compromising. Most of us are not ready to fully accept the type of advice he is giving. He warns about the need to select a qualified spiritual director that is in full compliance with the teachings of the Catholic Church. He laments that most priests are too busy to fulfill this duty and are not adequately trained in this task to be fully proficient at it. And he warns about "amateur" spiritual directors who have only minimal qualifications. Like I said, I need to re-read this book. There is so much more in it than just the topic of spiritual direction. "I am the Immaculate Conception"